In order to test my solo variation, I wanted a pretty simple scenario. I found this one on the Scenario-Wiki on the Honour forum. I only made some slight adjustments to the OB. The terrain is 10'x 5' (large for Lasalle). Details about scenario can be found at the above link. But essentially the scenario is based on a preliminary action on the day before the Battle of Talavera. Wellesley is with a small force monitoring the advance of the French forces west of the River Alberche and north of Talavera. Anson's Cavalry Bde is west of the Portina river and Wellesley has two small infantry bdes with him just east of the river. 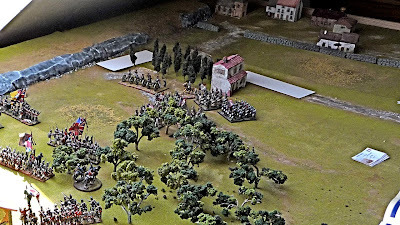 He has made a decision to stop the French force if he can, but he has no idea of the size of the force so he sends out four companies of the 5 /60th American Rifles to reconnoitre east of a large olive grove. Scenario specific rules include a 20 turn (large terrain, I want to see how the maneuver using cards works) game with possible bonus turns. There are no victory points, although if Wellesley is captured (which almost did actually happen) the game is of course over. The olive grove in front of the the farmhouse is rough terrain-soft cover, there is a 1 unit BUA on top of a hill to the extreme north. The river is impassable and the bridge can be crossed only in Column of March. 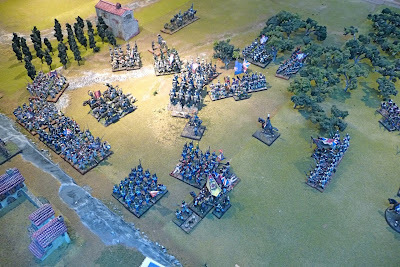 Aside from the 5/60th there is no movement from the British until the French are spotted. So the 7 cards are shuffled. Wellesley's card is drawn first, he gives orders to the 5/60th rifles to advance to the east to and return once the French advance is spotted. 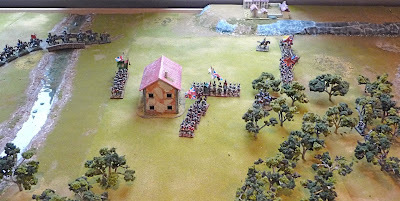 I will only run through the cards for the first turn, Next is Anson: no movement as French are yet to be spotted, Darricau: One French blind advances 8BW, Lapisse: Another French blind advances, Donkin: no movement, Laplane: The third French blind advances, Mackenzie: no movement. Pretty simple! The 5/60th advance through the olive grove. The French blinds continue their advance as does the 5/60th. The 5/60th come within 8BW of the first blind. A D6 is thrown=6, Darricau's Bde is revealed in Attack Column. Darricau's card is drawn next and his Bde advances toward the 5/60th. The final card is Lapisse and as he is CinC of the French forces he can nominate any of his subcommanders to move, he tells Darricau to charge the the 5/60th, all cards drawn, end of turn. 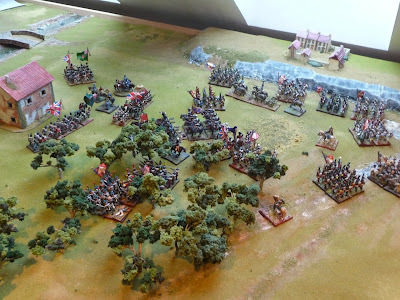 The British forces advance, Wellesley decides to advance Mackenzie's Bde in line and to use Donkin's Bde as reserve, Anson's Light Cavalry Bde advances in support. The first shots are exchanged between the 5/60th and the 9e légere, the 9e suffers the first DISR of the game (how do you like the nifty casualty marker). The Light Horse Artillery are unlimbered. The blinds advance.......which one is the dummy? 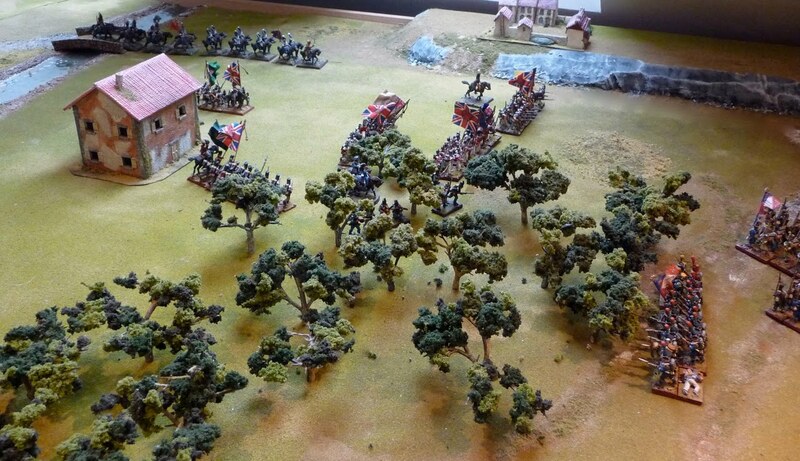 Mackenzie opens up a space between the 1/88th and the 1/KGL for the Light Cavalry to advance. Donkin sends in the 24th to support the KGL. The 5th are held back to protect the southern flank of Wellesley's force. The 94th are kept back in reserve. The 5/60th arrive back and report to Wellesley on the French forces, unfortunately they have only spotted the first brigade, so Wellesley feels he has sufficient forces to engage the French. Does he know that the 9e have started their advance through the olive grove. See sends the elements of the 5/60th to the KGL, 88th, 24th and 5th to enhance their skirmishing ability. Lapisse has decided to send one blind to extreme north for a more direct path to the west. The other blind is sent to the south. The French artillery fire at long range, the 88th suffer the first British DISR. Anson advances the cavalry to engage the French. The most northerly blind is spotted, it is Général de Brigade Laplante, he is a clever tactician, 3 battalions of the infamous 25e légere appear in column of attack. Wellesley is now in trouble he has 5 battalions of infantry and 2 regiments of light horse. Bearing down on him are 12 battalions of experienced French Infantry which include 3 battalions of valiant 25e légere. Moving through the olive grove apparently unnoticed is the 9e légere. Is history going to repeat itself? 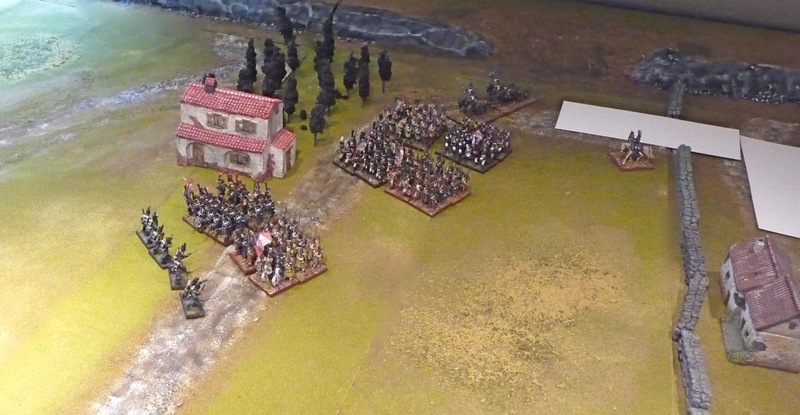 He decides to advance the light cavalry to slow the French advance. 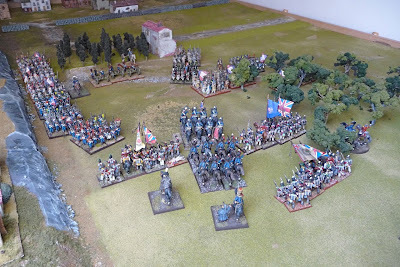 Some of the French infantry form square, but the 25e advance to engage the 88th. Mackenzie advances the KGL to charge the 76e ligne who have formed square in anticipation of an attack from the British light cavalry. Darricau's card is drawn, in combat the 76e break. He relimbers his light horse artillery they withdraw to the south. 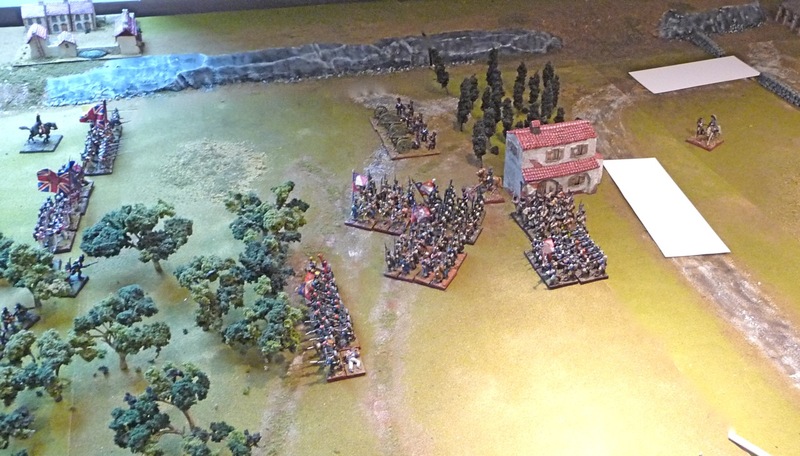 Anson advances the Light Dragoons to charge the 39e Ligne and advances the KGL Hussars to attack the French Ligne in the flank. 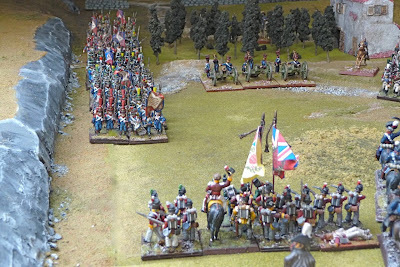 Lappise uses his card to reactivate Darricau's Bde, an indecisive combat results that the 39e win, the light dragoons are forced to fallback. Laplante uses his card to advance his forces and charge the 1/25e into the 88th. In response to the advance of the hussars he forms his threatened battalion into square. Somewhere in this melee, a combat ensues between the hussars and the French battalion, which the hussars lose decisively, they are also force to fallback. Laplante is good tactician and has a very helpful combat bonus. Wellesley now realizes his plight, he has 2 French battalions advancing through the olive grove, nine more battalions are advancing to the northeast, his 2 light cavalry units are falling back with significant casualties. He decides to withdraw across the bridge, it is difficult though as the KGL and the light cavalry regiments are separated from his main force. His card is the first drawn, he activates Anson's Bde, the light dragoons about face and the hussars wheel and head back. Donkin's card is drawn, he starts his retreat toward the bridge. Darricau's card is drawn, the 39e change from square into AC. 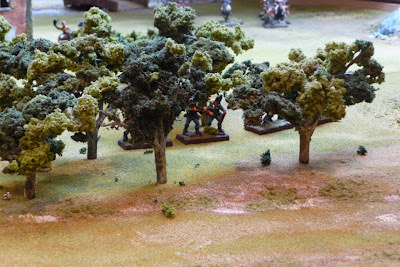 The 9e reforms into AC and they advance with the other battalion through the grove (from now on I will always form infantry into March column when going through rough terrain). 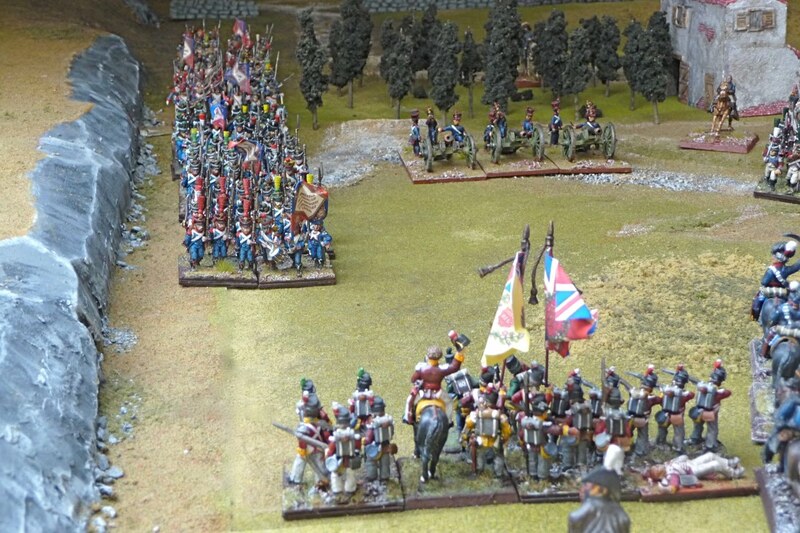 The light horse artillery are ordered to return, as the British cavalry are no longer a threat. Mackenzie's card is drawn, the KGL fire into the 39e and cause 1 DISR. A combat between the 1/25e and the 1/88th ensues, again Laplante's tactical bonus pays off and the 88th break. Laplane's card is drawn, he advances his force in an attempt to cut off the retreating cavalry. He charges the 39e into the KGL. Last card of the turn is Anson's, fortunately he is able to wheel the 2 cavalry regiments to the southwest to escape the clutches of Laplante. So at the end of Turn 10, the British tactical situation is pretty grave. Donkin's brigade has so far escaped unscathed, and is not in a bad position to retreat. 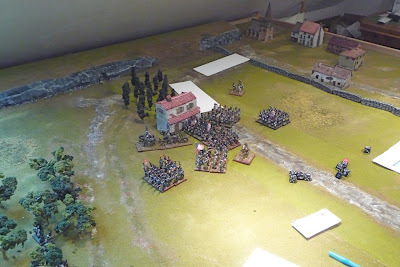 Mackenzie's brigade has been mauled with the loss of the 1/88th and the KGL are not only deep in the middle of the French but are engaged in combat with the 39e. Both of Anson's cavalry units have suffered 3 DISR and can easily break, Anson so far has been unsuccessful in trying to recover his cavalrymen. The British can only lose 2 more units before their morale breaks. How well was the integration of the activation system with the Lasalle game flow? Thanks Rafa, I was surprised myself how much the game did imitate history. And this was unforced. They only un historical part was the early arrival of Anson. The game is slightly slower than if it was Igo-Ugo, but parsing each turn into 7 mini turns does go very quickly and seems to work quite smoothly. I will try to write up Turn 11 in the exact sequence it goes. This is very interesting and combined with the other entry on the solo system seems like an excellent way of turning Lasalle into a truly solo experiance without over complicating the game. Excellent description John, I enjoyed following the blow by blow account and it gives me a good insight into the Lasalle rule mechanisms. Your terrain is very good, I especially like those trees. I have to say that the 'Lasalle' rule set are probably the most expensive I have seen! That said I think I'll invest in a copy. I think that 'Napoleon' and 'Napoleon's Battles' are still more expensives! Sam will actually send you a dented copy (very minimal damage) at a significant reduction, contact him through the store. I am going to email you a spread sheet, tell me if you can follow the phased action on each turn. I would like to get your opinion before I put it up on the blog. GREAT TO SEE ALL YOUR EXCITING PICTURES AND ALL YOUR HARD WORK.